This mob spawns at the southern LDoN entrance, just south of it. It roams once it spawns. This page last modified 2018-08-13 18:42:19. I followed the stop points, and made sure anything standing at a stop point was dead. Found the spawn point too, and all of the points seem to be correct. About 4 or 5 spawns later he popped - took all of 15 minutes. He did not move immediately when he spawned, but rather, waited politely for his one-shot. If you stand at the spawn point more than 3 minutes without a spawn then the ph is still out there roaming. Hit the stop points again and head back to the spawn location. Go to the LDON instance which is in the southern part of the zone. Suggest using Brewalls or some other map to find it easily. Just south of the the entrance to the tower an ice goblin whelp spawns roughly every 2 minutes and 25 seconds on TLP servers. This is the PH and it begins its path. Once you find this whelp it is easy. I have found the whelp is a more common PH than the leopard. Is this still active? tried killing the supposed PHs in everfrost forever. nada. Hits for up to 145 (I didn't turn my back to him). If the PH is up, you can usually find it on one of these locations. Location 3 is a good spot if you want to camp it, since this is were Phs/DA goes after first pop. Takes ~1-2 minutes from pop till he stops here for 10 minutes. If you kill PH, it takes approximately 26 min 30 seconds before another PH or Dark Assassin to pop. Every time I've seen him, its been in Everfrost. This has been many times. On my Druid, the main I used back in those days, he was a pretty easy kill. I'd kill him for fun, using my best wolf-form to keep ahead of his heightened run speed. I remember it was enough of a pain to keep Root on him that I opted in favor of kitting. For me, he's never dropped anything memorable but the Bloody Mantle. Everyone told me it was for the Rogue epic.. lol. Drops "Bloody Mantle" very commonly. Best place to look for him would be Everfrost, along the southern part of the tundra area, generally walking from the East to West parts of the zone, not along the southern wall, but still on the southern part of the tundra area. Cons Indifferent to all players I've seen encounter him before. I cannot remember ever seeing him ANYWHERE but ef peaks. When I was a teens shammy I spent quite a time killind the south tower in ef and I saw him NUMEROUS times (and always stayed WELL away). If I was to look for him hang round the south tower. Right about the south tower, I zoned out of an LDoN dungeon and saw this guy spinning in circles next to the river. Dblue con to 65, conned indifferent to ranger of tunare. No faction hit for killing him. He resisted ensnare and earthen roots a couple times. He moves fast even snared. once root stuck, it was all over. Burned trueshot and pounded him with arrows. Died pretty fast. If i had known this was for casters, i would have ooc'ed the mantle. Also had a combine dagger on him. Saw him spawn several times (with the spin that everything gets at that spawn point) at the northern most lizard man camp on the rathe side of the river in ferrot. Actaully just a little north of it easily within sight of the lizardman camp even while on the opossite side. A spider usally spawns there (and spins) but sometime other lower level things. Good fishing while you wait for spawn. if you want to find this guy he can be a pain to find he spawns in more zonesten listed and that makes for alot of looking lol just thought i would share the info about thezones ihave found out he can spawn in i a none has any others plz post reply. happy hunting i still have not foundhim. Anyone know how long he stays in a zone when he appears. Does he depop real quick. 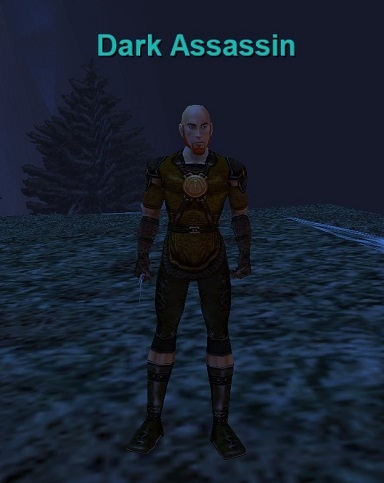 Just wondering if id have time to track him with my ranger and when i found him log in my necro to take him out. as a barb shaman, everforst is my starting zone. this is my first character so im a newbie. since i didnt know anyone really, i solod in everfrost the whole time until mams stopped giving me xp (about 36). so i had spent most of my playing over the first 3 months there, and saw the dark assasin no more than 5 times. i went about 3 weeks in between sightings once, so in my opinion, hes REALLY rare to spawn - be aware. First attempt I nearly had him, even without SoW. Insidous Retro was key, but I let it wear off once and got beat up. I *think* his spawn point is -1150, -4000. I had killed all the woolies, wander goblins, and everything else between South tower and the South gobby camp for about an hour, maybe 2. I was about to expand my hunt further East when I saw him. He was standing still, but spinning. I called in a cleric's help and found a bard to assist, he went down easy then. Good luck all who hunt the Dark Assassin. OK, let me make some corrections to my last post about the DA. 1. He is a random spawn. That's it. No PHs. Nothing. Either you're gonna be lucky or you're not. 2. Once he pops, here's a step by step way to killing him. I'm a level 52 necro and he was a joke this time around. You'll need to be sowed and your pet has to have sow too. That's all you'll need as for assistance. DA is just too quick for jboots. Once you get sow, make sure you Augment Death on pet and MAKE SURE you have MANASKIN up on yourself. Manaskin will make the difference between life and death here. Once you see DA, hit him with a splurt and send pet in. Now, here's the clincher. Do NOT cast any Darkness spell on him. They just get resisted too often on this guy. You want to hit him with Insidious Retrogression next. It's a DD snare that has a MUCH higher percentage on landing than the Darkness spells. It never got resisted while I fought him. At this point, you should have DA splurted, snared and pet on him. He'll come after u after Insid Retro, just step away and fear him. If Insid Retro breaks while he's feared, just follow his pathing while pet beats him. This is why having pet sowed is important. This guy is real fast when not snared. Try to land an EvB on him and just continue this pattern. If you have to run from him while he's not snared, just run and keep checking pet health. Once you see pet health going down, that's when you know it's safe to turn back and cast on DA. Otherwise, you run the risk of being backstabbed and that's how I failed my first few attempts at soloing him. I would stop before my pet got the aggro back and DA would backstab me to death. Anyway, I slaughtered him with this method. I used maybe half my mana and it was a joke. Last night I camped the DA in Everfrost for about 4 hours. I followed all the instructions from the posts here and I never got him to pop. I ran from n1000, n5500 to the south igloo gob camp at n1000, n1500 and I only found the supposed PH (the ice goblin whelp) once in that pathing. After I killed the whelp (and he was only there once in that 4 hour span) I was excited and thought that I may have finally triggered the spawn but the DA never showed. I tried killing the goblins at the south igloo camp but that never did anything. I also tried killing the goblin whelps at the p1200, n1000 igloo camp but that didn't do anything either. Anyways, this morning, I had about an hour to kill so I decided to look for this guy again. But this time, I tried a different strategy. I still followed the same pathing as I described above but I killed all the wooly mammoths and wooly mammoth calves that I came across. A fellow necro informed that he had done this quest a long time ago and he got the DA to spawn by killing woolys. Needless to say, it worked. He popped. I found him walking west around n1000, n2800. I was completely solo and I tried to get some of the other lvl 50+ guys in the zone to help me but no one would. Hence the life of a necro. So I splurted him. Sicked pet. Ran. Took some damage. Feared. Dooming Darknessed. BoDed. Re-feared. etc. etc. etc. I got this SOB down to 1/2 bubble of health and I f@cked up. He was going down. My pet was beating him, he still had a splurt dot on him and he was chasing me. And like an idiot, I stopped to try to get one last fear off. The SOB backstabbed me and that's all she wrote. So that's the deal on this guy. DO NOT believe the hype that he's 100% magic resistant. My initial splurt landed immediately and he resisted fear once and dooming got 1 resist as well. Also, he's fast but he's not too fast. I outran him with jboots so SOW should make you pretty uncatchable by this buy. He is definitely soloable by a lvl 52 necro. You just have to be real smart about it. Dont do what I did. Dropped the bloody mantle and now I find out its for a erudite necro shoulder piece thats NOT multiquestable. /sigh =P guess its time to log back on and destroy it. -_-. I really hate to destroy items that I KNOW lead to a good quest piece. So this guy is Beta Neutral or at least indifferent to all? I play a wood elf druid and seen him on tracking many times but always stayed away from him. His name sounds like something that would attack a good race/class. Conned dubious to a Cazic-Thule worshipping Ogre Shadow Knight. This mob is not needed for the pally FA quest. Just clearing the air a bit. The place holder in Everfrost is not neccessarily an ice goblin scout - it is any monster that walks from the tower to the two igloo camp near the bottom of the map - I know because I killed a leopard that was following this route and later on the assassin spawned and followed this path - he despawns at the igloos - but he respawned at least two more times straight away and followed the same path to the igloos. I hunt by the south tower in EF quite frequently. And I see him very often there. He has never aggroed on me or my party at that location even during heated battles with multiple MOBs. killed him 2 days ago took me about 30 min. He all but imposible to snare and will NOT stay rooted so I just DoT kited him til he died.